TERMINAL TACKLE → Split Rings, Springs & Swivels → Owner Centering Pin Spring 8ct. Owner Centering Pin Spring 8ct. 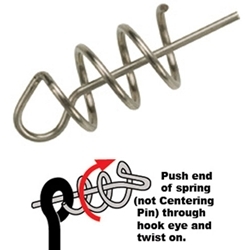 Owner's Centering-Pin Springs attach to hook eyes, and allow any soft plastic bait to be "permanently" secured by inserting the pin in the center of the bait's nose and then screwing the bait onto the coil spring to rig perfectly everytime! This centering-pin spring has far superior holding power compared with barbed stick-pin holders. These interchangeable stainless steel springs come in two sizes to optimize the holding strength for any size bait.